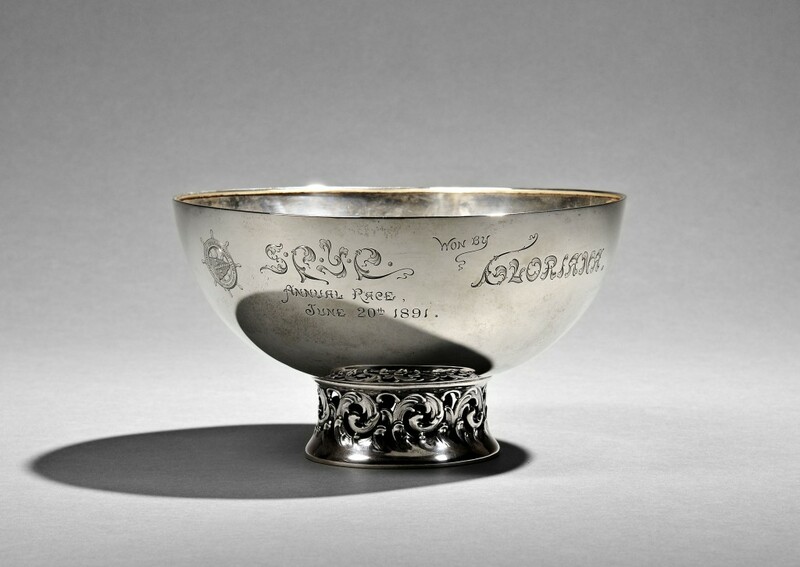 Silver Yacht Trophies Recall a Long History of America’s Cup Races | Skinner Inc. In the 18th and early 19th century, yacht clubs were established in European countries such as Russia, Ireland and Sweden. The first club in North America was the Royal Nova Scotia Yacht Squadron, which was established in 1837. Some of the earlier and more prestigious clubs in the United States were founded in New York, including the New York Yacht Club, the Larchmont Yacht Club and the Seawanhaka Corinthian Yacht Club. The prestige of these clubs came not only from their members, but also the quality of their yachts. Nathanael Greene Herreshoff was responsible for many of these impressive yachts. A premier yacht builder and mechanical engineer who graduated from MIT, Herreshoff built the yacht of every America’s Cup winner from 1893 to 1920. His designs revolutionized yacht building, and he would work for anyone who had the money, regardless of who they were or what club they belonged to, making him in demand by those who wanted the best and fastest yachts. For yacht owners and yacht clubs, having the best of the best was crucial for racing. Prestigious yacht clubs often participated in races against other American clubs and international clubs. Vessels that participated and placed in these races received handsome trophies engraved with the name of the vessel, the name and date of the race, and the participating winner or runner up. These trophies were mostly made of metal, including sterling silver, silver plate, pewter and bronze. Through the years many of these trophies have surfaced on the open market, and collectors have eagerly scooped them up. 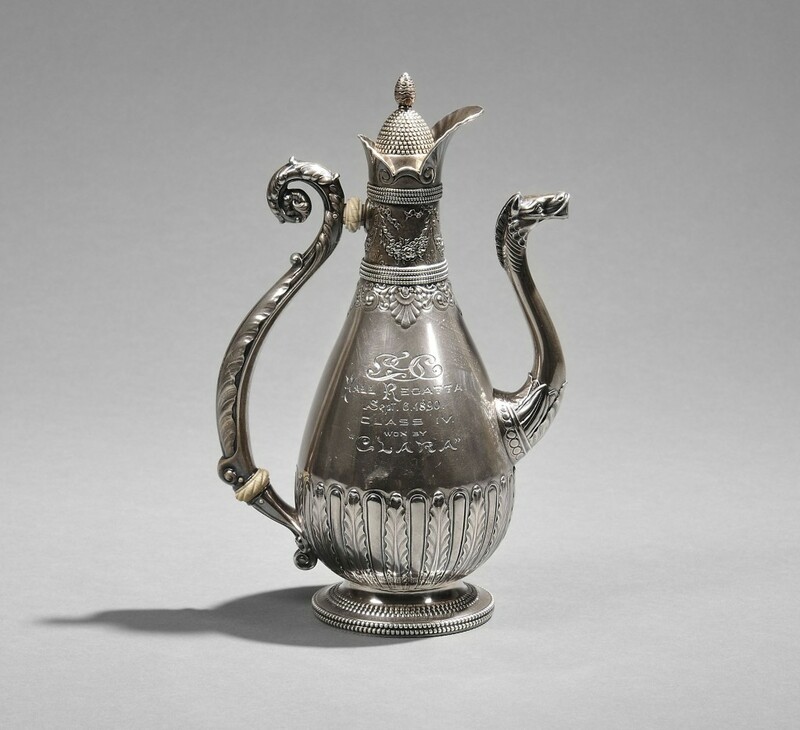 Skinner has the privilege of selling a private west coast collection of silver yacht trophies as part of our October 11, 2014 European Furniture & Decorative Arts auction, which features fine silver. This entry was posted in Blog and tagged America’s cup, bronze trophies, Larchmont Yacht Club, Nathanael Greene Herreshoff, New York Yacht Club, pewter trophies, Royal Nova Scotia Yacht Squadron, sailing, Seawanhaka Corinthian Yacht Club, silver plate, silver trophies, sterling silver, Stuart Slavid, yacht, yacht club, yacht race by Stuart Slavid. Bookmark the permalink.